Here I describe a model for analyzing serious games based on activity theory. The model can also be used for serious game design as a tool to evaluate prototypes. This post is a short summary of an academic article published in Computers & Education (link in the text). An important part of my PhD research has been a theoretical one: I have been trying to understand the internal structure of serious games, particularly how gaming and pedagogical elements are connected to each other in a game to reach its educational goals. This objective supports my overall goal of building a framework to help serious games designers and developers in a very practical way, ultimately making it easier and cheaper to produce serious games. Recently, I and my colleagues published an article in the journal Computers & Education, titled An activity theory-based model for serious games analysis and conceptual design, in which we describe a model for serious games analysis and conceptual design. The article is also available in this website, in the Research & publications page (author’s version). What is this ATMSG model about? The main idea of the ATMSG model is to support a systematic and detailed representation of educational serious games, depicting how the combination of serious games elements supports pedagogical goals. As the name indicates, the model uses activity theory as underlying theoretical framework. Activity theory is a line of research initiated in the 1920s and 1930s by a group of Russian psychologists. It studies different forms of human practices and development processes, providing a model of humans in their social and organizational context 1. 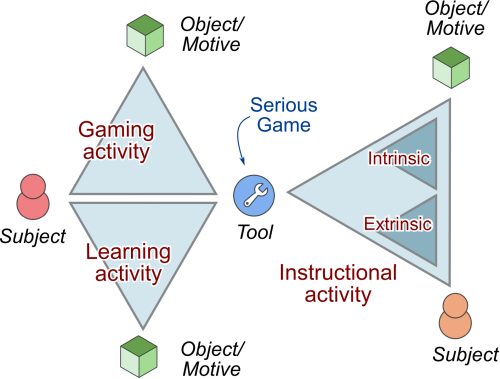 Activity theory provides us with a way to reason about the relationships between serious games components and the educational goals of the game, considering the game as part of a complex system that involves at least three activities: the gaming activity, the learning activity and the instructional activity. The figure below illustrates the model. The hierarchical structure of the activity also gives us the ability to change the focus of the analysis to different levels of detail. In ATMSG, each activity is broken down into a sequence of actions mediated by tools with specific goals. Each of these items is called “serious games components”, that is, the “concrete” pieces of a serious game that compose the game play over time, e.g. characters, tokens, tips, help messages, etc. We used the ATMSG model described above to reorganize existing taxonomies of learning, instruction, games and serious games (such as the game Ontology Project, Learning mechanics — Game Mechanics (LM-GM), GOM II, Bloom’s taxonomy, Gagné’s Nine Events of Instruction, ARCS Model of Motivational Design), into a unified vocabulary. The taxonomy is organized in a tree structure in which items are classified according to the activity to which they belong, and, within the activity, categorized as actions, tools or goals. It aims to aid in the identification and classification of components according to their characteristics and roles in the game. You can check the full taxonomy in the original article (or in the author’s version of the article). We defined a four-step process to guide users in analyzing existing serious games or prototypes. These steps take the user from a high-level understanding of the activities to the concrete components that implement those activities. The user identifies game components with the help of the taxonomy of serious game components. In the first step, the user describes the main activities involved in the activity system and identifies their subjects and corresponding motives. Then, to help in the identification of the components of the serious game, the user produces a diagram that represents the game sequence in a rough timeline. Subsequently, the user identifies components related to each node of the game sequence. Each event in the game is decomposed into its actions, tools and goals. Finally, the user groups each set of actions, tools and goals. For each of those blocks, the user analyzes how these components go together in the game and explains how the usage of such components and characteristics support the achievement of the entertainment and/or pedagogical goals of the game. You can see an example here: an ATMSG analysis of the game DragonBox (PDF, 343 kb). Will ATMSG be useful in my project? The ATMSG model can be a little bit complex and it has a steep learning curve to users with little or no experience with games 2. For this reason, it is recommended as a tool for the analysis of existing serious games when a thorough understanding of the characteristics of the game is needed, for example when adapting games for use in specific learning settings, or when detailing the analysis to identify and catalog learning patterns. It can also be a helpful tool when evaluating game prototypes during the design process, providing a way for the design team to understand how well their game ideas can support the desired learning objectives before any code is written. Interested in this topic? Don’t hesitate to contact me! M. B. Carvalho, F. Bellotti, R. Berta, A. De Gloria, C. Islas Sedano, J. Baalsrud Hauge, J. Hu, and M. Rauterberg, “An activity theory-based model for serious games analysis and conceptual design”, Computers & Education, Volume 87, September 2015, Pages 166-181, ISSN 0360-1315, http://dx.doi.org/10.1016/j.compedu.2015.03.023. You can find the author’s version of this paper in my Research & publications page. 1. The best book I have read with a good and understandable explanation of the theory was “Acting with Technology”, by Victor Kaptelinin and Bonnie A. Nardi, particularly Chapter 3. 2. We evaluated this in a user study comparing ATMSG to LM-GM. The dataset and files for replication studies are released as Open Source and public domain.